The large mill in this engraving was built c. 1800 by Ephraim Gurley for the production of steelyards and other iron tools. In 1827, the Mansfield Silk Company was founded and the Gurley mill was purchased for the new enterprise. This was the second silk mill in this country and the first successful venture in silk manufacture. Unfortunately, investment in the M. multicaulis mulberry and failure in a weaving venture led to bankruptcy and the dissolving of the company in 1839. The other small mill in the engraving was a trip hammer shop, also now gone. This mill was built on the site of the old Mansfield Silk Company mill. Various owners manufactured silk in this building, the last being William E. Williams who purchased the mill in 1865. In the early 1920s, Leo Heinige Sr. and Fred Grasmeyer established a button factory in the old mill; Leo Heinige Jr. took over the business in 1939. When the mill burned to the ground in May 1946, the Mansfield Button Company built a new factory across the street at 287 Gurleyville Road; it ceased manufacturing around 1960. This mill was built by James Royce in 1848. In 1862 Emory B. Smith, a son-in-law of James Royce, formed a partnership with Royce and soon after bought the mill and silk business. The front part of the building, near the road, was a boarding house for the mill workers. The mill burned in 1921. The foundations and sluiceway are still very visible by the bridge on Gurleyville Road. 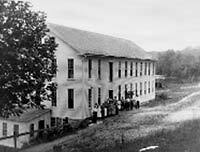 Zalmon Storrs operated a silk mill in Mansfield Hollow as early as 1833. Over the years the mill changed hands a number of times and others were built. Eventually a large complex developed which was known as the “Railroad Building”, presumably because of its length and the number of connecting buildings. Silk thread was last produced there by the Paisley Silk & Thread Co., founded in 1867. The mill was sold to the National Thread Company, a cotton thread manufacturer, in 1880 and two years later the wooden mill complex was torn down. A stone mill, now known as the Kirby Mill, was built on its site. In 1835, William Atwood and Henry Crane built this silk mill by the Mount Hope River in Atwoodville. The mill was purchased by Lewis D. Brown in 1865 and then was sold to J. MacFarlane & Sons in 1871. The mill was operated as a silk mill by the MacFarlanes until 1919. The mill was torn down in 1928. Another silk mill was also built in Atwoodville in 1850. William Atwood, his son John Edwin Atwood and Horace D. Russ engaged Edwin Fitch to build this mill downstream from the earlier mill. It was burglarized and burned in 1877. Unfortunately there is no pictorial record of its appearance. All that remains are its massive foundations with their impressive arched stonework. Joseph Conant built a small silk factory on this site in the 1830s. Orwell Chaffee began to manufacture silk there in 1842, and by 1863 his operations had outgrown the small factory. The old mill was torn down and he engaged Edwin Fitch to build a larger mill on the site. He formed the company O. S. Chaffee & Son with his son, Joseph Dwight Chaffee, and they operated under that name until his death in 1887. Joseph Dwight then formed a partnership with Charles Fenton to form the Natchaug Silk Company in Willimantic. Olon, Joseph Dwight’s brother, took charge of the Chaffeeville mill and ran it until 1902. In 1912, Alfred Oden bought the vacant mill to use as a canning factory and around 1920, the old mill was torn down. In 1853, Joseph Conant built a small silk mill and dye house on this site. The mill was purchased by Charles L. Bottum, W. E. Williams and D. P. Conant in 1856, and then passed through a number of hands. The mill was doubled in size in 1869. The last business to produce silk thread in this mill was the Max Pollack Company, which operated there from 1900 until the 1940s. The mill then had several incarnations — as a dance palace known as Pollack’s Park, a chicken farm, the All Day Motel (Mansfield’s first “wet” establishment), and finally as the Shaboo Inn — which showcased music acts for 11 years until closing in May 1982. The former mill was gutted by fire on August 13, 1982; arson was suspected. In 1821 Rodney Hanks built another mill, located across the road from the first one, and was joined in business by his son, George R. Hanks. A new and larger mill was built on this site in 1854. It passed to George Philo and John S. Hanks in 1858, and was operated as the P. G. & J. S. Hanks Company until 1893. After fire destroyed the mill in 1882, a fourth mill was built on the site. This mill operated until 1928 and is now a private residence. At the far left are mill owners, John S. and Ozro Hanks.